At the request of our Rwandan partners, a second cohort of ten EFFO trainers was trained. This was at the backdrop of the recent outbreak of Ebola virus disease in the bordering province of North Kivu in the Democratic Republic of Congo (DRC). As a neighboring country, the risk of Ebola virus disease spreading to Rwanda is classified as very high by the World Health Organization (WHO). Thus, in November 2018, three staff members of the Robert Koch Institute (RKI) and a colleague of the Institute of Tropical Medicine and International Health of the Charité Berlin, who brings field experience during the Ebola epidemic in West Africa, travelled again to Rwanda. During the first week, ten new EFFO trainers who work in the border regions with the DRC were trained in the capital Kigali. In the second week, the new trainers then trained 15 nurses from health centers in the border region - under the supervision of the RKI staff in Gisenyi (Rubavu District, border town to Goma, DRC). Rwanda now has 19 EFFO trainers who can be deployed, working in mixed and interprofessional teams (men and women, doctors and nurses); the diversity in the composition of the teams has proved to be extremely successful and beneficial. 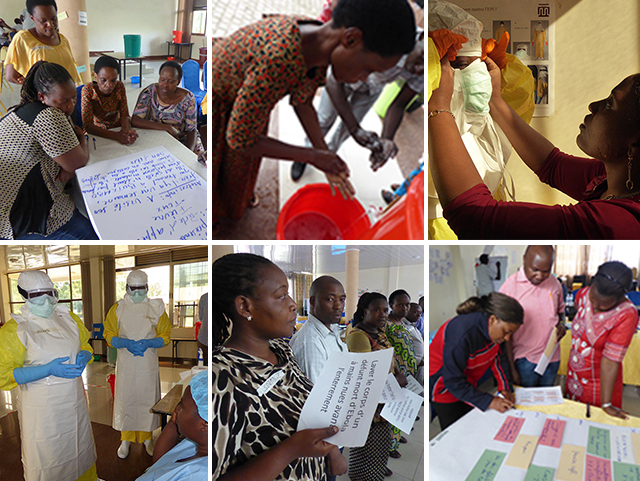 Under the leadership of the Rwanda Biomedical Centre, Rwanda's national public health institute, the teams of trainers are now to conduct further EFFO trainings for colleagues in health centers in the border region to prepare them for a possible outbreak. The EFFO project will continue to support this endeavor. Further, at the beginning of 2019 another simulation exercise will take place at a hospital in the border region to the DRC. Further information on training method and content at: www.effo.rki.de.